Register for your FREE JBF account giving you access to our online tagging system! Join our Consignor Facebook group to meet other consignors just like you! Prepping your items is easy with our online tutorial videos. It's simple, smart and fun to help families save money and keep our landfills clean + make money for your own family too! If you chose to donate unsold items to our charity partner when you tagged, you're done! Otherwise, you'll pick up your unsold items after the sales event. ...and two weeks later your check goes in the mail! JBF Consignors Earn an average of over $300 at each sale! Want to earn more and shop even earlier? Volunteer and earn 70%! Sign up to help and create lasting memories with other volunteers! Earn 70% (10% more) on sold items! Early shopping priviledges! The more you help, the earlier you shop at our exclusive consignor presales! See times below. Please note: No children are allowed during any shift for safety purposes. Work one 4 hour inspection shift and earn an 8 hour presale pass. Work one 4 hour breakdown shift and earn an 8 hour presale pass and we'll waive your consignor fee! Work one 6 hour breakdown shift and earn a 12 hour presale pass and we'll waive your consignor fee PLUS feed you pizza and you'll shop at 70% OFF donated items before pick up! *You must be able to stand for longer than 4 hours, lift 35 lbs without concern of any medical conditions or injuries that may be affected and must commit to the full shift. For your safety, no pregnant women allowed to work breakdown shift. Check in before unloading your items. You'll be provided a rolling rack to help unload once you are checked in. Remember, to save time, bring your items tagged, prepped and sorted by type and size. Bring your signed Consignor Agreement, Car Seat Checklist, & Crib Waiver, if applicable. See important links tab below to download. If you have over 1000 items or large furniture, please email janabookmiller@jbfsale.com to schedule drop off time to ensure we have enough rolling racks available and plenty of room for you to place your items on our sales floor. A JBF Volunteer will inspect your items at drop off before you place your items on our shelves and wracks in the appropriate areas. Please plan on roughly 60 minutes for drop off, depending on how many items you are selling. Drop off will close promptly at listed time. Bring your ID and tubs or other containers to pick up your unsold items. 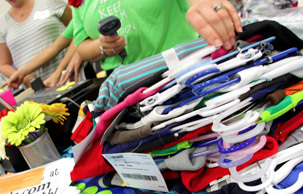 A JBF Volunteer will be there to assist you to your items, which will be sorted for pick up by your consignor number. Please plan on 60 minutes for pick up, depending on how many items you have left. Pick up will close promptly at 8:00pm and all remaining items will be donated to our charity partner by 8:01pm! ANYTHING that has to do with raising a newborn to a teen! At JBF Austin North & Central, we have a "$3.00 Minimum Suggestion." If your single, hanging clothing item is not of a $3.00 value on it's own, please pair it with something that will bring the total for the items to at least this amount. You can pair two onesies together, for example. REMEMBER: Price to Sell! Generally that means 1/3 of the original retail price. Brand names and designer do well at JBF. Tag Location MUST be in the upper right of all clothing items for easy shopping. Attach tag with a safety pin to the upper right pocket area of the shirt or upper right front of pants. Punch a hole at the top of the tag to make it easier to slide the safety pin through. *If you use a tag gun please insert the gun in a tag/label or inside seam NOT through part of the clothing (to avoid making a hole or tear in the clothing). Also, pull on the tag to make sure it is properly secured and will not come off easily. Tagging guns can be found at Hobby Lobby and www.storesupply.com. Please use ANY SIZE wire or plastic hangers. If you are having trouble finding hangers ask co-workers, neighbors and friends for their dry cleaning hangers. Old Navy will often provide hangers if you ask, as well as some dry cleaners you frequent. Remember to safety pin garments to the top part of the hanger so the garment will not slide. Please have your clothes sorted by size and gender. This will make drop off easier and faster for you. Furniture sells really well. All kinds of children's and juvenile furniture will be accepted. No couches or dining tables. To keep our reputation of 'only the best', JBF asks that you be very selective about the quality of your furniture. All furniture must be intact, put together and sturdy. Loose Items like blankets, bibs, cloth diapers, bottles, small toys, bows, socks, etc. must be in clear Ziploc bags with the tag attached to the inside or outside of the bag. Blankets and Snugis sell better if they are hung over a pant hanger. Be sure to put a safety pin on them so they don't fall off the hanger. Use clear packing tape for securing the bags closed. This prevents 'little' hands from reaching in. Must be in excellent condition and not out of date. All Season of maternity clothing will be allowed at our sales. Please do not bring out-dated maternity clothes. They just will not sell- especially in Austin with our fashion savvy moms! Please secure the tops with safety pins if they have a tendency to fall off the hanger. Breastfeeding tops are accepted with maternity clothing. Other Maternity Items: belly bands, breast pumps, pregnancy books, etc. sell very well. Please be aware of our goal....to be the BEST in the consignment business. Shoes with dirt or mud will not be accepted. Must be tied in pairs by shoelaces or put the shoes in a clear baggie. Attach a tag with a large safety pin to the laces or tape the tag on the bottom of the shoes or the bag. For shoes with no laces, put them together in a Ziploc bag with the tag taped to the outside of the bag. Tape the bag closed with heavy packing tape. All toys must be in working order, BATTERIES INCLUDED or they will not be accepted. Make sure to clean them before drop off. Small parts should be bagged and taped to the main part very securely. Use HEAVY packing tape. If parts get separated, it will not sell. Games and puzzles should have all pieces and be tied or taped closed. Several small items can be grouped together in Ziploc bags (books, rattles, grab bags for small toys). We will ONLY accept stuffed animals that are LIKE NEW! No other stuffed animals will be accepted. Again, you MUST secure Ziploc bags with packing tape so that pieces do not get lost! Large toys and outdoor play equipment must be clean, free of dirt and or water. Mr. Clean Magic Erasers work well on these items. Name brands sell great at JBF! Infant equipment includes car seats, strollers, high chairs, swings, exersaucers, bouncy seats, boppies, play gyms, pack and plays and bassinets. Car seats cannot be older than 6 years old and must have the owner’s manual. This is a federal requirement and you will need to have two carseat waivers filled out upon drop off. All items are inspected for QUALITY at JBF so our shoppers can expect only the best! If your items don't pass inspection, they will be returned to you. Here are some ways to make sure your items will pass inspection. Inspect for stains under bright light. Sometimes milk stains are hard to see! Make sure to test your batteries. We only accept items with working batteries! Clean your shoes, soles included. We don't want to put dirty shoes on our kiddos' feet, so clean those shoes before inspection! Shoppers are picky. After all, we're shopping for our babies! 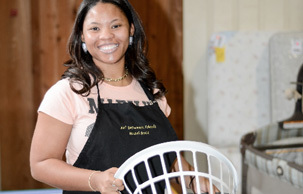 You'll see a lot higher sales and earn more money when you take the time to prep your items! This is what differentiates us most from other resalers. In fact, JBF corporate employs a Certified Recall Specialist to keep our events up to date on recalls. Locally, each item is inspected for SAFETY so our shoppers can shop resale without worry! Check the CPSC recall list on your items. Make sure there are no pull strings on any item around the neckline! Fill out our carseat and crib waivers and follow their instructions. The More you Help, the Earlier you Shop! *Sorry, no children, strollers or wagons allowed at this PRESALE aside from infants carried by you or in a sling/ carrier. This is for safety purposes. *Until 1pm, we may still be inspecting items. As a volunteer, please help by pulling out any unacceptible items (dirty or not working) during shopping times before consignors and the public arrive! Event Closes promptly at 9PM. Admission valid beginning at times listed above until closing. This 1/2 price pre-sale is only for Consignors / Volunteers and there is no carry overs allowed from our full price sale. (aka, no items may be placed on hold or stashed for purchase). Our public sale day event will remain open to the general public at FULL price in order to maximize your consignor sales and all consignors will have a dedicated check out line to receive 50% off participating items. Bring your photo ID to the entry door beginning at 5pm. You can shop before this, but at full price for fairness to our consignors. YOU MUST present your ID at 5pm in order to receive your identification to shop at 50% off any item without a star on the tag. One Accompanying friend allowed per consignor / volunteer and they must come with you to check in to receive their credentials. including at your 1/2 price presale, so bring the family along for the fun! Don't let friends miss out!